DUBAI // The French “spider-man” Alain Robert will climb the Burj Khalifa on Monday after the building’s owner gave him the go-ahead. He will start to ascend the world’s tallest building at 4.30pm and continue through the evening under a giant spotlight. He expects to reach the top of the 828-metre tower some time between 10pm and midnight. The 48-year-old, who has made his name free climbing other towers around the world, has agreed to wear a safety harness to satisfy a condition set by Emaar, the owner and builder of the tower. The tower has several ledges and on each of these there will be a member of a safety team to belay him. “I will be able to rest a little on each ledge,” he said. The climber, who suffers from vertigo, climbed 43 storeys in about 45 minutes yesterday morning. “I checked it out a little and now know it is climbable,” he said. The climb is part of the 10th anniversary celebrations of Education Without Borders (EWB), an international student conference that will take place in Dubai this year. As part of the 2003 EWB conference, Mr Robert climbed the National Bank of Abu Dhabi building in view of almost 100,000 spectators. 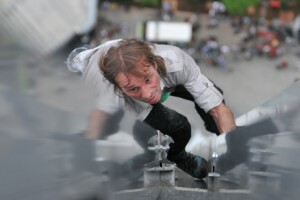 In 2005, he climbed the 160-metre Etisalat building in Abu Dhabi. For the 2007 EWB, he climbed the 185-metre Adia building, also in Abu Dhabi. He also climbed the Murjan Tower twice in Dubai Marina in 2004 during the Dubai Shopping Festival. “I would like to climb the Burj al Arab next, but right now my priority is the Burj Khalifa,” he said. Between now and Monday he will go back to the tower to make some final checks. He is also working with the EWB and is accompanied by a representative of the French government and a photographer, who will document the event. Dr Tayeb Kamali, the vice chancellor of the Higher Colleges of Technology and chairman of the EWB conference, said Mr Robert was a role model for students. “Alain Robert is a firm believer of using inner strength and determination to achieve goals in life, which is strongly reflected in the philosophy of Education Without Borders,” Dr Kamali said. Mr Robert has been climbing since his teens, scaling more than 100 of the world’s tallest buildings. He has also been arrested on several occasions for trespassing. He was fined US$567 (Dh2,100) after scaling the Petronas Twin Towers in Kuala Lumpur in Malaysia. Other famous buildings he has conquered include the Sydney Opera House and the Sears Tower in Chicago.